Place the milk in a small saucepan and sprinkle the gelatine over the top. Allow to sit, without stirring, for 5 minutes. Put the saucepan over a low heat and stir for a couple of minutes until the gelatine has dissolved. Add the honey and cinnamon and stir for about 30 seconds until the honey in dissolved. Do not allow the mixture to get too hot or boil. Take the saucepan off the heat and stir in the cream and salt. Pour the mixture through a strainer (to get rid of any lumps of cinnamon) into 6 glasses or ramekins. Allow to set in the fridge for at least 4 hours. 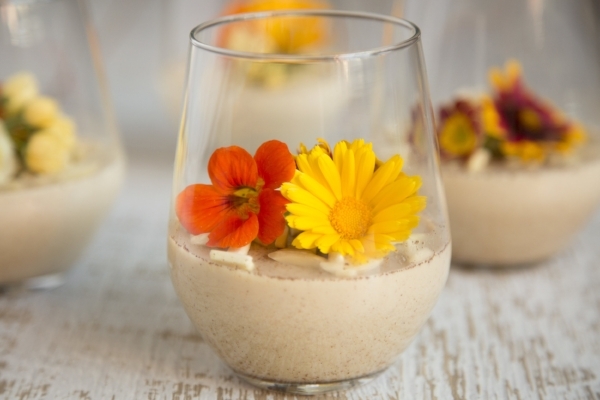 Serve with nuts on top for some crunch and edible flowers for presentation (we used flowers from Sprout House Farms).